The crests of two De Geer moraines can be seen in this image. Photo by Joseph Licciardi. Take a drive through the countryside of Durham and the New Hampshire Seacoast and you might notice a series of tiny rolling hills that look like regularly-spaced ridges. While the repeating pattern may be eye-catching for drivers and sometimes challenging for cyclists, UNH researchers found they may also hold answers to how glaciers helped form the current terrain and provide insight into the progression of climate change. Using high-resolution LiDAR (light and detection ranging) laser technology, the researchers discovered for the first time that the landscape is riddled with washboard-like ridges, an unusual type of glacial moraine formed by the continental ice sheet as it advanced and retreated. The study, by Samantha Sinclair ’13, ’15G and professor of Earth sciences Joe Licciardi, was recently published in the Journal of Quaternary Science. “Unraveling how the ridges, known as De Geer moraines, formed was really exciting and a bit like working as a detective — piecing together small clues until we were finally able to see the big picture,” Sinclair says. Averaging 1.7 meters tall and spaced 104 meters apart, the ridges mark the spots where the edge of the great continental ice sheet either paused or pushed forward for long enough to pile up or bulldoze a ridge of debris in front of it. Not only are they unusual — De Geer moraines only form in certain specific areas around the world and had not been recognized in New Hampshire — they’re helping determine an annual record of ice retreat across this part of the Granite State. 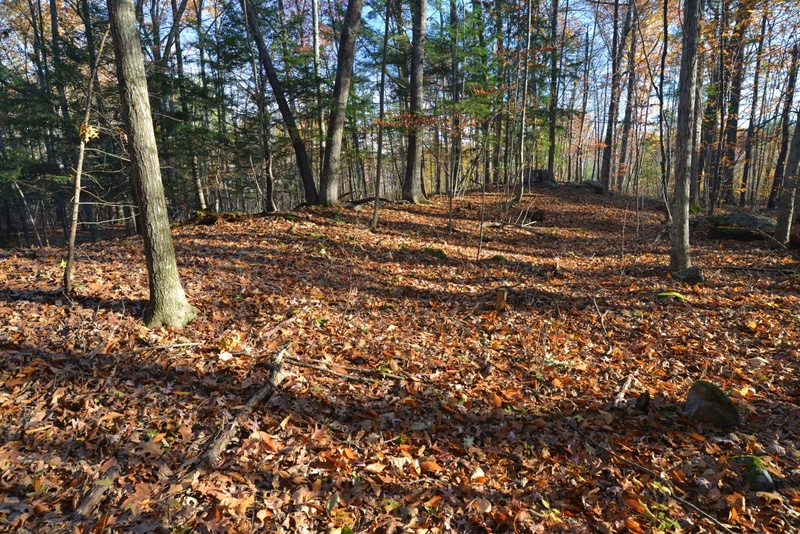 To figure out how they formed, the researchers identified and mapped all the ridges they could find in the area, measured their dimensions, dug into them with an excavator and examined the way the sediment had settled into place, and used radar to “see” below the ground surface. 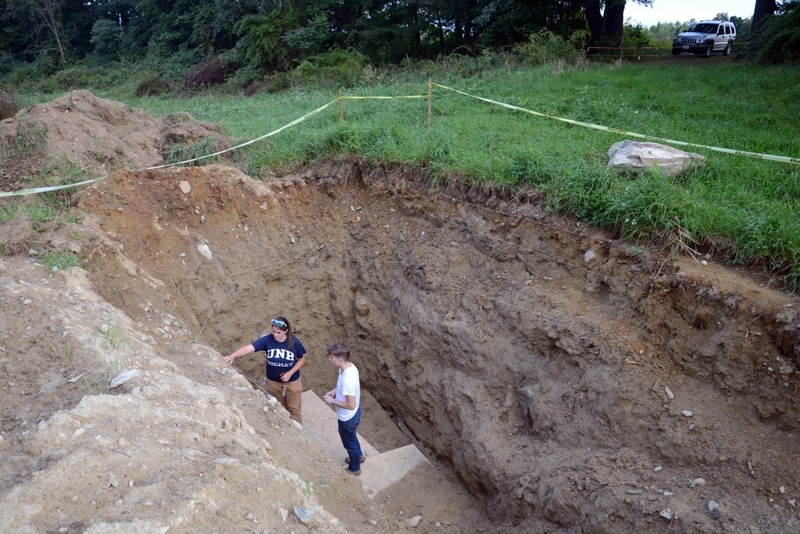 Study lead author Samantha Sinclair ’15G examining sediment deep within an excavated moraine. Photo by Joseph Licciardi. Identifying the origin of these ridges, they say, helps determine an annual record of ice retreat across this part of New Hampshire and may hold answers to the effects of climate change. LiDAR scans, he says, were instrumental in helping to reveal a whole new world that was not previously visible on satellite images, topographic maps or even by simply driving around. The researchers say the high-resolution laser helped to unveil scientific clues that were lying in plain sight and yet remarkably went unnoticed until now. Co-authors on this study include Brian Madore ’13 and Seth Campbell with the U.S. Army Cold Regions Research and Engineering Laboratory, which is where Sinclair has worked since receiving her M.S. from UNH . Funding was provided by student research grants from the Geological Society of America and the UNH Department of Earth Sciences, a scholarship supported by John Herndon and a fellowship from the UNH Graduate School.